The Scottish premiere of Irving Berlin’s Top Hat took place last night at the Edinburgh Playhouse bringing a touch of class to the chilly November evening. This is the only showing of this production in Scotland during its 17 week tour ahead of its opening at the Aldwych Theatre, London. Based on the film of the same name, the story centres around Jerry Travers (Tom Chambers), the famous American tap dancer, who arrives in London to appear in his first West End show where he meets the irresistible Dale Tremont (Summer Strallen), the girl of his dreams. Naturally the course of true love never runs smoothly and a case of mistaken identity threatens to prevent the couple living happily ever after. 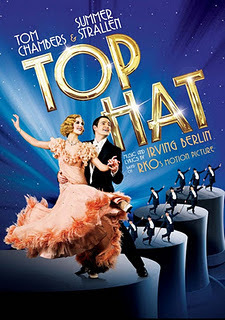 Top Hat is widely regarded as one of the greatest dance musicals and it is easy to understand why after seeing this production. Dance takes centre stage throughout the musical with intricate tap dances and glorious ballroom pieces featuring the ensemble in sweeping ball-gowns framed by a stunning art-deco inspired set. This is a rich production and the beautiful set brings to mind the recently refurbished Savoy Hotel in London. The elegant ensemble dance pieces showcase the tremendous talent in this cast of over thirty individuals. Tom Chambers tackles the footwork required by the role of Jerry with enthusiasm and captures the essence of the dashing hero well. 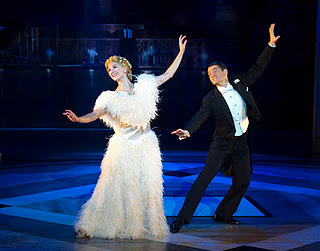 Summer Strallen is graceful and brings plenty of fire to her portrayal of Dale Tremont. Strallen and Chambers steal the show with their dance in Venice. The white dress (pictured right) cannot be easy to dance in but Strallen does so with style. Horace Hardwick (Martin Ball), Horace’s valet Bates (Stephen Boswell) and Alberto Beddini (played by Russell Leighton Dixon at this performance) bring wonderful comedic elements to the piece delivering some superb one liners such as Horace’s take on marriage: “a man’s incomplete until he’s married, after that he’s finished!”. Featuring classic songs from the original film Cheek to Cheek and Top Hat White Tie and Tails as well as additions from Berlin’s extensive back catalogue like Let’s Face the Music and Dance ensures there is always a beautiful accompaniment to the striking footwork. This production is a shimmering reminder of the golden era of dance musicals. I don’t doubt that its popularity among audiences is assured by the dance revival spearheaded by programmes such as Strictly Come Dancing and the West End will be richer for it. Don your top hat, white tie and tails and see it at the Playhouse before the West End snaps it up.